Looking for an alternative to the typical Sunday morning church service? 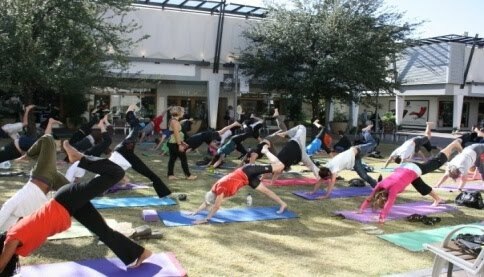 Refresh your spirit and balance your chi with Sunday yoga @ the Biltmore. Hosted by Lululemon Athletica, this free weekly event takes place on the lawn in front of the store (see picture to the left) @ 1030a. Space is limited and it fills up fast so everyone is encouraged to arrive early to grab their spot. Sunday's class will be hosted by instructor Laura Bleam, Owner of Sumits Yoga on Camelback.